The recovery of great preaching calls for the revival of the Christian community as a disciplined, knowledgeable, worshiping community of people. The recovery of preaching and the recovery of the community will have to take place together, because there can be no recovery of a vital Christian community, well informed, apart from the recovery of great preaching. And on the other hand, a great congregation makes a great preacher. And catechesis is the indisputable foundation of a great congregation! In this age of change and boasted improvement, we have witnessed with regret, the increasing disposition of Christians to depart from ancient standards and formularies of doctrines. How far the love of novelty has influence in producing this state of things, we are not prepared to say. The fact is that innovations and changes are easily effected, and the old paths are forsaken; often, seemly because they are old and have been trodden by men of other ages, and new ones are chosen, seemingly because they are new and without examination, whether they will conduct safely or not. Perhaps in no portion of the Christian church has the change been greater, than in the congregational churches of Connecticut; ancient standards of doctrine in these churches, have been suffered to pass away, not by a public and formal objection, but by silent neglect on the part of individual churches in order to accommodate and receive to their communion such as would dissent from doctrines contained in their old standards. To this as one cause silently operating, may be traced as we believe the gradual decrease of the congregational churches in Connecticut, and the increase of other denominations. Doctrinal standards give stability, and secure uniformity of sentiment and discipline, and then adhered in the denominations embracing them, they serve to strengthen and increase that denomination but when such standards are trodden down or thrown aside, the denomination is changed in its distinctive character, notwithstanding the name should be still retained. The Saybrook Platform, on whose doctrinal basis, the Congregational churches of Connecticut are organized, and on whose articles of agreement in discipline, they have been consociated, have become an obsolete book—it is but little known—and scarcely to be found in a bookstore for sale. By many of the younger members of these churches, it is doubtful whether it has ever been read. It is not long since that a proposition was made in the General Association of Connecticut that a new edition should be printed, and that it should be recommended to some booksellers to undertake the work.—But the proposition was opposed on the ground that some Congregational pastors could not subscribe to the Platform without reservations in regard to particular doctrines; and after some discussion it was indefinitely postponed. It was apparent, that most of the younger pastors chose to have the Platform lie forgotten and die a natural death if it would. It is well known also, that some of our theological professors cannot subscribe to this manual of doctrine without written reservations. The creed also of individual churches, originally in substance in strict uniformity to the doctrines of the Platform, and of the shorter Catechism, are now subject to frequent alterations. In some, one doctrine is omitted—in others more, and the language throughout changed for the purpose of rendering the doctrines retained more palatable.—Frequent changes of pastors also greatly contribute to changes in the creeds of individual churches; old creeds are thrown by, and new ones substituted to be more accordant with the taste of the age and the supposed improvements in theology.—In this manner, old standards of doctrine are lost sight of, and many of the congregational churches embrace a mixture of Calvinism, Arminianism, and nothingism, and in this state are in danger of crumbling to pieces. 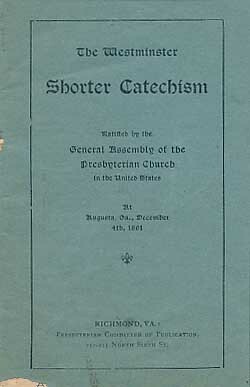 The loss of the Shorter Catechism to the congregational churches is very great.—When that catechism was taught regularly in our schools and in our families and on the Sabbath it laid a good foundation in the minds of children for religious improvement, a foundation which contributed to consistency and stability in after life. Though children have greater advantages for gaining religious knowledge by means of Sabbath schools and Sabbath school libraries, still, in point of doctrinal stability and knowledge of religious truth, it is questionable whether they are to be compared with what their parents were when they were children. The catechism has gone from families as well as from schools and parents are in danger of leaving their own duty to be performed by Sabbath school teachers and of acting as if the responsibility were taken off from them. Parents should not feel that their own obligations are lessened, while they have the co-operation of Sabbath school teachers. They can do that which no other class of teachers can do in the religious education of children, and all teachers need their co-operation and support. Religious education should be commenced in families and by parents, and it should be conducted under their watchful eye. The Assembly’s shorter catechism is a standard manual, which will never wear out. Religious parents have no occasion to be afraid of this, nor to lay it aside as an obsolete catechism, though the phraseology in some trifling particulars might be changed for the better, still as a whole, this catechism is sound—we shall find no better catechism; it has been fully proved, and it will be found safe for the rising generation.—We will remember the time when this catechism was regularly taught in common schools, and under what circumstances it was excluded. We have been associated with school visitors who denounced it and who declared that they would prefer Paine’s Age of Reason to be taught to the children. The fact is the great and essential truths of the Bible are embodied in this catechism, and these truths have always been opposed to the natural heart in man, and infidels and men of loose sentiments have scouted them in past ages, and in the present age they continue to do this. We should rejoice to have Christian parents bring back this manual into their families, and to have them teach it to their children and to expound it to them as they are able, and we should also rejoice to see it revived in our Sabbath schools, and adapted as a text book in Bible classes. We have no doubt that the effect would be salutary in forming the character of the rising generation. [excerpted from The Charleston Observer, Vol. X, no. 29 (16 July 1836): 113, columns 2-3.